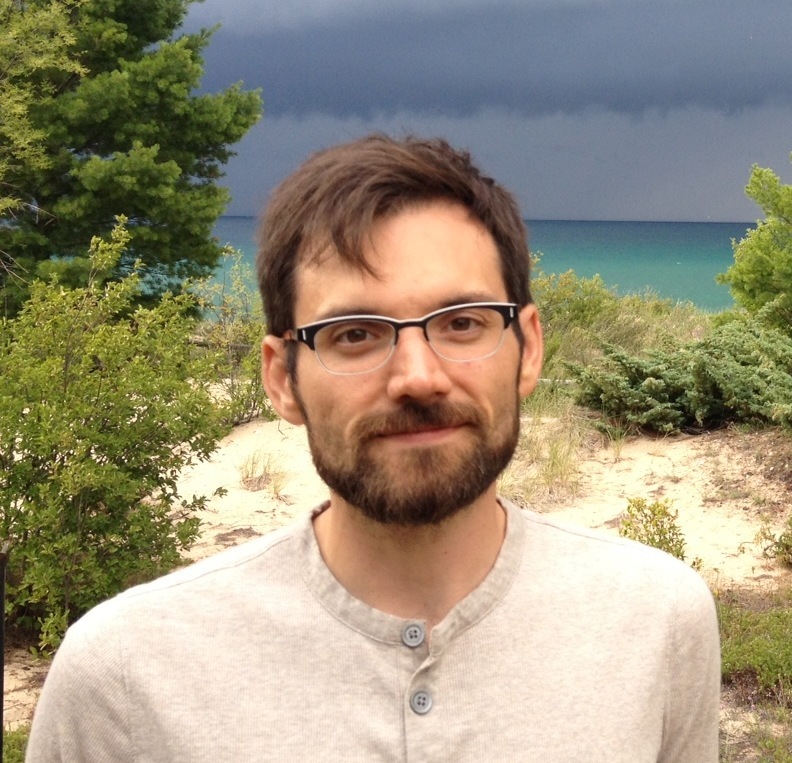 Eric Anderson, GLERL oceanographer, used to study the movement of fluid inside bone tissue — now he studies the movement of water in the Great Lakes. Eric Anderson is NOAA GLERL’s resident oceanographer (but his Twitter handle is @lakeographer—you should trademark that one, Eric). At its core, his research centers around the movement of water. You might have seen our animations of currents in the Straits of Mackinac, or of meteotsunamis coming across Lake Michigan — he’s the guy behind those computer models. Some cool things about Eric are that he plays the banjo, that he used to study the movement of fluid inside bone tissue, and that he’s quick to remind us people were watching the Straits of Mackinac millennia before his computer models existed. Read on to learn more cool things! My research is on hydrodynamics, which is a fancy way of saying the moving physical aspects of the water in the Great Lakes—things like currents, temperatures, ice, and waves. Most of my day is built around looking at measurements of the water and air and then developing computer models that simulate how the lakes respond to different weather conditions. This field of science is particularly helpful in safe navigation of the lakes, responding to contaminant spills, search and rescue operations, and understanding how the ecosystem responds to different lake conditions. What is the most interesting thing you’ve accomplished in your job? Maybe the most rewarding has been working on the Straits of Mackinac. It’s one of the most beautiful spots in the Great Lakes, but also one of the most dynamic, with high-speed currents changing every few days, if not hours. A groundswell of attention to the Straits in the last several years has pushed the public to get more engaged and learn about the conditions in the Straits, and I’ve been glad to help where I can. As part of this work, we’ve found some 1600’s-era [settler] written accounts of the currents in the Straits. We also know that [Indigenous] people have been watching the Straits for thousands of years, and it’s rewarding to continue this thread of knowledge. What do you feel is the most significant challenge in your field today? It seems like the hardest thing is to communicate the science. People are starved for information, and there’s a real love out there for learning about the Great Lakes. All we can do is to try and keep the flow of information getting out to the folks who care, and just as important, to those who don’t think they care. When you see environmental science covered in the news, it’s usually reporting on something negative or even catastrophic, which is certainly important, but there are pretty cool discoveries being made routinely, big and small, and those don’t often seem to make it to the headlines. We have to keep working hard to make sure these stories make it out, and at the same time keep our ears open to the concerns that people have for the lakes. Where do you find inspiration? Where do your ideas come from in your research or other endeavors in your job? Inspiration is everywhere. Try to hike up to a good vantage point overlooking the lake, like the dunes or a bluff, and not feel inspired. More often, though, inspiration comes from talking with other people, whether scientists, students, or interested members of the public. I can’t think of a time where I’ve given a public seminar and not walked away with a new question or idea to investigate. People’s enthusiasm and bond with the Great Lakes is infectious, and so I try to tap into that as often as I can. Two meteotsunamis, large waves caused by storm systems, came across Lake Michigan on April 13, 2018. Eric Anderson models meteotsunamis in his role as oceanographer at NOAA GLERL. How would you advise high school students interested in science as a career path, or someone interested in your particular field? I took somewhat of a winding career path to get where I’m at with GLERL, working in car assembly plants and then on the nano-fluidic flow inside bone tissue before ending up in physical oceanography. I didn’t really know what I wanted in high school or college, but I knew physics and math were where I felt at home. So I found a way to learn the fundamentals that I’ve been able to apply in each of these jobs, and that allowed me to explore different parts of science and engineering. Not everyone will have the same chances or opportunities, but if you can find a way to really solidify the fundamentals and just as importantly seek out a breadth of experiences, you’ll be in a better position when those opportunities do come along. What do you like to do when you AREN’T sciencing? I’m either hanging out with family, playing music, or talking with someone about how I wish I was playing more music. What do you wish people knew about scientists or research? By and large, science is curiosity driven, often fueled by the scientist’s own enthusiasm, and in my case also by the interests of the public. Whether it’s a new discovery, or re-codifying or quantifying something that others have observed for millennia, there’s no agenda here other than to understand what’s happening around us and share whatever pieces we can make sense of. I’ll add a sweeping generalization that scientists love to talk about their research, so don’t be afraid to ask. Categories: Communication | Tags: 3-D Modeling, Currents, forecasting, great lakes, Hydrodynamics, Modeling, Research, Researcher Profile, Straits of Mackinac | Permalink. Update 08/09/2016: The buoys have drifted ashore and are being collected! The map below shows their full journey. 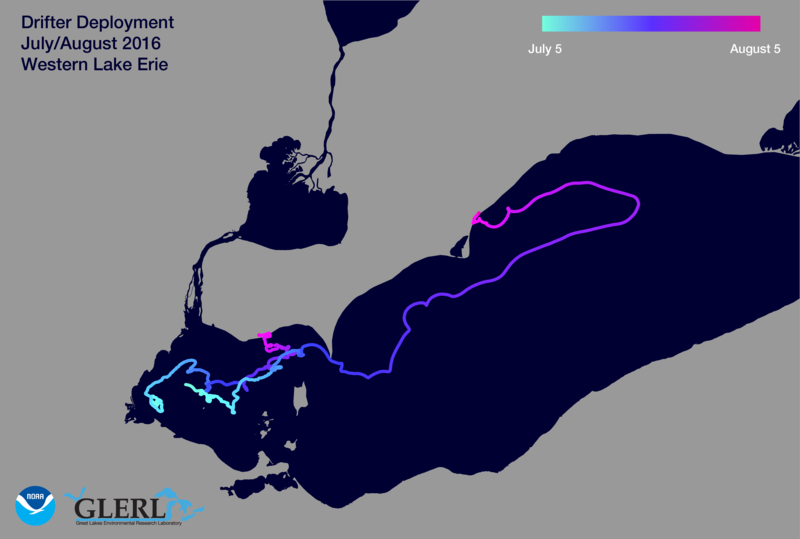 This map shows the journey of the drifters from July 5, 2016 to August 5, 2016. Created by Kaye LaFond for NOAA GLERL. Click image to enlarge. 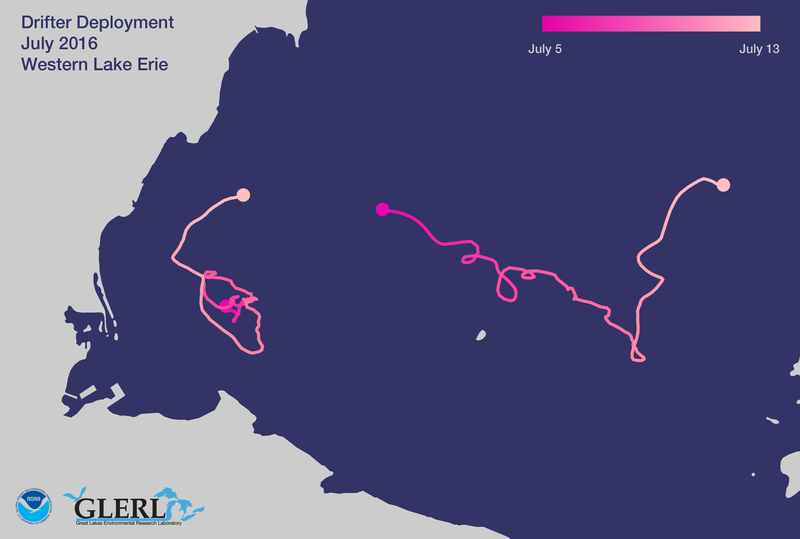 Last week, GLERL scientists released two mobile buoys with GPS tracking capabilities, known as ‘Lagrangian drifters’, into Lake Erie. We are now watching the buoys move around the lake with interest, and not just because it’s fun. The drifters help us test the accuracy of our Lake Erie hydrodynamics model, known as the Lake Erie Operational Forecasting System (LEOFS). This map shows the progress of the drifters as of July 13, 2016 08:19:00. Created by Kaye LaFond for NOAA GLERL. Click image to enlarge. LEOFS is driven by meteorological data from a network of buoys, airports, coastal land stations, and weather forecasts which provide air temperatures, dew points, winds, and cloud cover. The mathematical model then predicts water levels, temperatures, and currents (see below). We use these modeled currents to predict the path that something like, say, an algae bloom would take around the lake. In fact, this is the basis of our HAB tracker tool. The strength of LEOFS is in how well the modeled currents match reality. While there are a number of stationary buoys in Lake Erie, none provide realtime current measurements. The drifters allow us to see how close we are getting to predicting the actual path an object would take. Researchers will compare the actual paths of the drifters to the paths predicted by our model. This is a process known pretty universally as ‘in-situ validation’ (in-situ means “in place”). Comparing our models to reality helps us to continually improve them. For more information and forecasts, see our Great Lakes Coastal Forecasting homepage. For an up-to-date kmz file of the drifters (that opens as an animation in Google Earth), click here. Categories: Communication | Tags: Buoys, Currents, lake erie, lake levels, LEOFS, temperature, weather, Winds | Permalink.